Is it me, or has ice-cream seen a resurgence in popularity recently? For a while, it seemed all the rage was for fancy frozen yogurt shops, and their infinite number of topping combinations. I was never a fan of frozen yogurt so I, for one, couldn’t be happier that ice-cream returned to the limelight. Here in San Francisco, there seems to be an ice-cream parlor, stand, pop-up, creamery, or what-have-you in every neighborhood. What’s great about it (other than the convenient accessibility for whenever the mood strikes) is that all the ice-cream shops in my hometown all have their own charm, ranging from the classic nostalgia of Fentons and Mitchell’s, all the way to the hipster-flavor-chic of Bi-Rite or Mr and Mrs Micellaneous. We’re even making waves here; Smitten formulates their ice-cream with liquid nitrogen, while Humphry Slocombe is releasing a highly anticipated recipe book. But, how does that really affect me and my relationship with ice-cream, or yours for that matter? Trying new flavor combinations and seeing all the interesting things these folks are doing to rekindle the love for this frozen delight is amazing, and sometimes mind-palate-blowing. 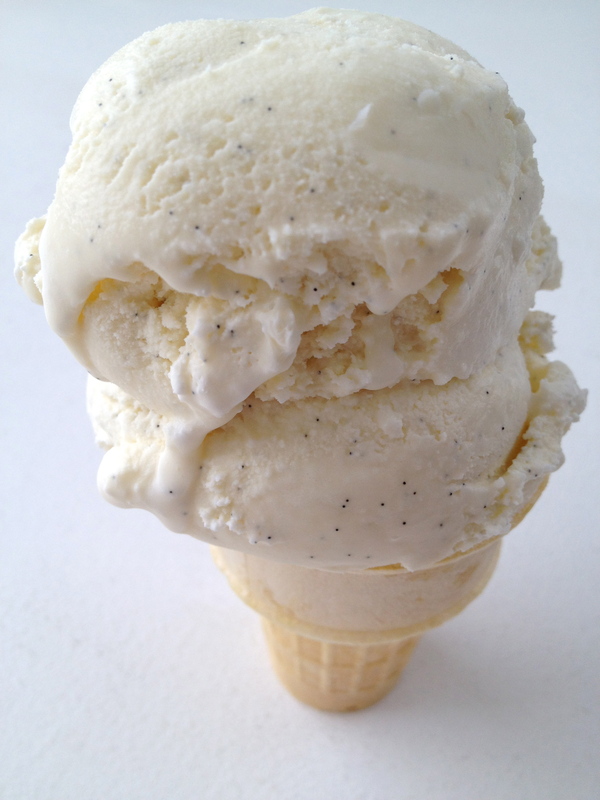 But for me, in the kitchen, I’ll always go back to my favorite: vanilla. I guess you could say I’m old fashioned that way. 1. In a medium saucepan, combine milk, sugar, eggs, vanilla seeds and pod. Cook over low heat, stirring constantly, until mixture slightly thickens, enough to coat the back of a spoon (about 4-6 min). 2. Remove pan from heat, pass the egg mixture through a fine mesh strainer into another medium sauce pan (or large bowl). Discard the vanilla pod. Stir in the heavy cream, vanilla extract, and almond extract. 3. Cover and refrigerate mixture until chilled, then freeze mixture in an ice-cream maker according to the manufacturer’s directions.